This week’s review items come courtesy of Nana and Justin, a couple of college friends of mine who are living, teaching, and blogging in Japan and who are kind enough to mail me Japanese goodies from time to time. 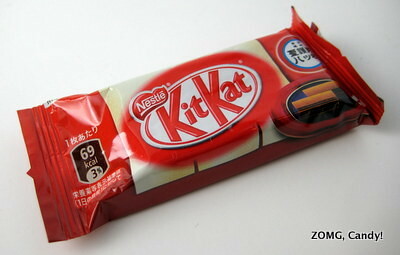 I’m closing out the week with a review of a Japanese Kit Kat that is a Kyoto speciality – it’s Yatsuhashi flavored! What is Yatsuhashi, you ask? Wikipedia to the rescue! Apparently, it’s a famous regional dessert of Kyoto that’s made of glutinous rice flour, sugar, and cinnamon. 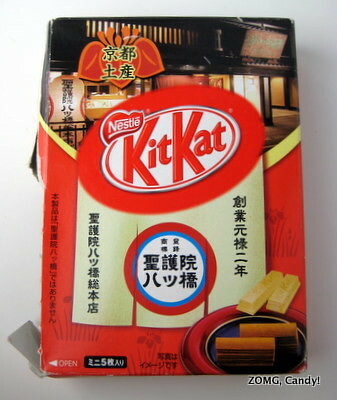 The Yatsuhashi Kit Kat had classic Kit Kat‘s flaky, crisp wafers but was covered with a crumbling white coating. Alas, the coating was falling to pieces by the time the Kit Kats got to me, so I wasn’t able to get a good glamour shot. Nana and Justin and others have sent me Japanese Kit Kats for review that all arrived in pristine shape, so I think the disintegration was due to the fact that the coating was frosting-like, whereas other coatings have been chocolate-based. Still, though it didn’t look that great, it tasted awesome! The white coating melted mostly smoothly on my tongue and tasted like vanilla frosting made from fresh cream. 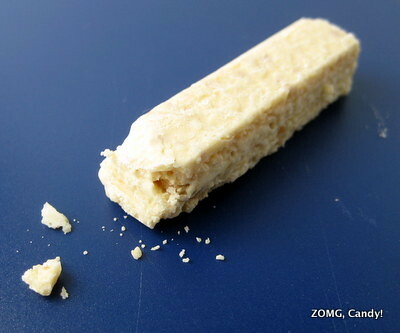 Every once in a while, I hit a crunch from a grain of granulated sugar. The whole thing was topped off by a sweet cinnamon kiss that floated above the sweet and crunchy confection. 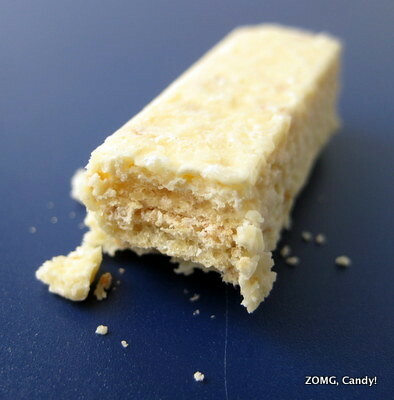 It sorted of reminded me of Cinnamon Toast Crunch or a crunchy Snickerdoodle, except that the vanilla frosting coating had a dairy freshness to it that made it even better. Yet again, I must lament that the Kit Kat flavors available to us in the U.S. are pretty lamely tame in comparison to what’s available in Japan. An OM. For alternative takes, check out Eataku’s review (which clued me in on the proper name for this treat) or Jim’s Chocolate Mission (which helped confirm that I had the right name for these guys).